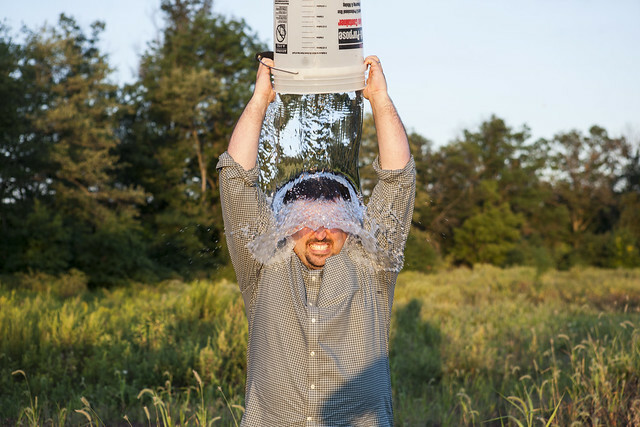 The Ice Bucket Challenge has been a tour-de-force for charitable donations, and has raised a staggering amount of money for the undoubtedly underfunded organisations in the US and here in the UK. If you haven’t already, I’d urge you to consider donating to this worth cause and to find out more about the disease and how it affects people. It seems like a no-brainer, right? Not quite. Yesterday I was nominated and all of my misgivings were brought to the fore. Do I just do it and get on with life, or do I look like uncharitable douche and shun the craze. Luckily, thanks to Dan James and Paul Boag there’s a third option, just giving (no trademark infringement intended). I don’t want to dwell on the negatives, because after all this campaign has done a lot of good and helped to raise awareness about Motor Neurone Disease. There are also a number of people who have described my misgivings in far more eloquent terms (feel free to check out the links in the notes section at the bottom). Mostly I dislike the focus on dumping ice on your head rather than regularly supporting a charity and understanding the work it’s doing. It also feels very wrong to be wasting water and energy when 884 million people lack access to safe water. Multiple sclerosis is a disease which affects over 100,000 people in the UK alone, and has no known cure. It’s a degenerative disease of the nervous system and affects people in a myriad different ways but often affects vision, sleep and mobility. Multiple sclerosis is close to my heart because my father has suffered with it for over 10 years. Last year I cycled from Bangor to Switzerland to raise money for the MS Trust and awareness of multiple sclerosis in general, and hope to do an even bigger challenge in the near future. The MS Trust is a charity focussed on helping people with multiple sclerosis by providing information and support, and funding research and training for healthcare professionals. I particularly like that they are all about helping sufferers of MS, enabling them to manage the disease and still make the most of their lives. Until a cure is found it’s the support networks and education within the healthcare industry that has a huge impact on people living with MS. So today I have donated to them again, and reminded myself that I need to do more. So my message is really this: find a cause you care about and think about what you can do to help. Maybe it’s donating money, in which case remember that regular small donations have a much more positive effect than one-off larger donations. Maybe it’s a more hands-on approach offering pro-bono work or heading to a local centre to help out. If you feel comfortable evangelising your goodwill in the hope of raising awareness that’s fine too. If you’re not and want to keep your charitable donations under wraps, that’s fine too. After all, it’s not about us really. So it’s my turn to hand on the baton and nominate three more people to highlight a charity they care about or give to a charity and tell us about them. But why stop at three? Three’s to few. Instead I nominate you, the reader, to take up this challenge. I know you’re there, so don’t shirk your responsibility. Let me know when you’ve done it in the comments. Or don’t if you’re a bit bitter that I got you into this mess. If you don’t like the sound of that, feel free to dump a bucket of icy water over your head and upload it to YouTube as well. It’s all helping spread the word for good causes.